A Blog devoted to World's Fairs & Expositions, and other historical & contemporary subjects. 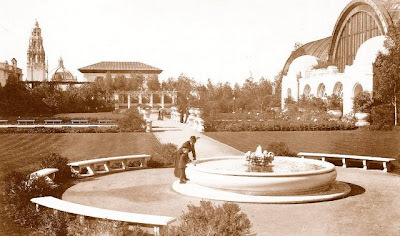 The Botanical Gardens occupied a large rectangular area in front of the Panama-California Exposition's Botanical Building; and were enclosed by the Home Economy & Sacramento Valley Counties Buildings on the west, and the Varied Industries & Food Products Buildings on the east. 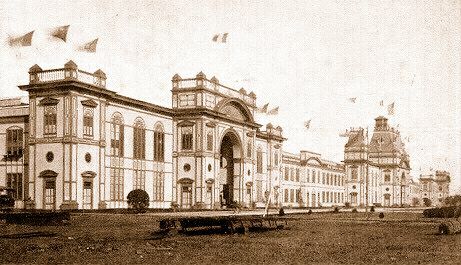 Extending north from El Prado were two main walkways giving access to the Botanical Gardens, between which was located a large rectangular lagoon, known as La Laguna de las Flores, measuring 193-feet long by 43-feet wide. At the head of the lagoon was a balustraded bridge, crossed by a transverse walk. At the west end of this walkway was situated a Roman-style pergola, fronted by a tiled terrace with a low iron railing; while at the walkway's east terminus was located a balustraded terrace, backed by a tile-roofed arcade connected to the Food Products Building. Also located near each end of the transverse walkway were raised circular basins, each containing an ornately designed Baroque fountainhead. The Botanical Gardens were surrounded by a thick growth of eucalyptus trees, and planted with spacious lawns, shrubbery, palms, and many flowering plants. A low hedge of blue lobelia framed La Laguna de las Flores, and the bordering walkways were lined with Italian-style benches and ornate bronze-green light standards. 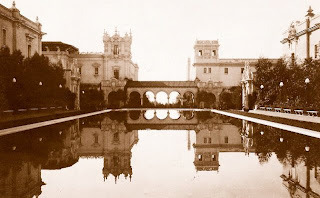 The view south across the lagoon, toward El Prado, revealed a mirrored reflection of a tile-roofed colonnade and the neighboring towers of the Commerce and Industries & Foreign and Domestic Arts Buildings. November 3rd - 16th, 2008: San Francisco 1894 - California Midwinter International Exposition. November 17th, 2008 - January 7th, 2009: New Orleans 1885 - The World's Industrial and Cotton Centennial Exposition. January 8th - 31st, 2009: Long Beach 1928 - Pacific Southwest Exposition. February 1st - March 6th, 2009: San Diego 1915 - Panama-California Exposition. March 7th, 2009: San Diego 1916 - Panama-California International Exposition. March 8th - April 12th, 2009: San Diego 1935 - California-Pacific International Exposition. April 13th, 2009: San Diego 1936 - California-Pacific International Exposition. February 1st, 2018: 1884-NEW ORLEANS-1885 The Great World's Fair - book published!